These muffins look absolutely stunning and are a much healthier alternative to the classic chocolate chip muffins. In this recipe most of the dairy fat / vegetable oil is replaced with coconut oil and sugar is reduced to a low amount. Yet the chunks of the white chocolate still make these muffins taste sweet and delightful. Plus, you get the added health benefits of the green tea. Beat the eggs in a large bowl and mix well. Warm the coconut oil to liquefy and add to the eggs. Melt the butter and add to the egg mix. Add sugar and milk and mix well for 3 minutes. Sift the Matcha powder together with the flour. Sifting the Matcha powder is important to prevent any bitter tea lumps forming in the mixture. 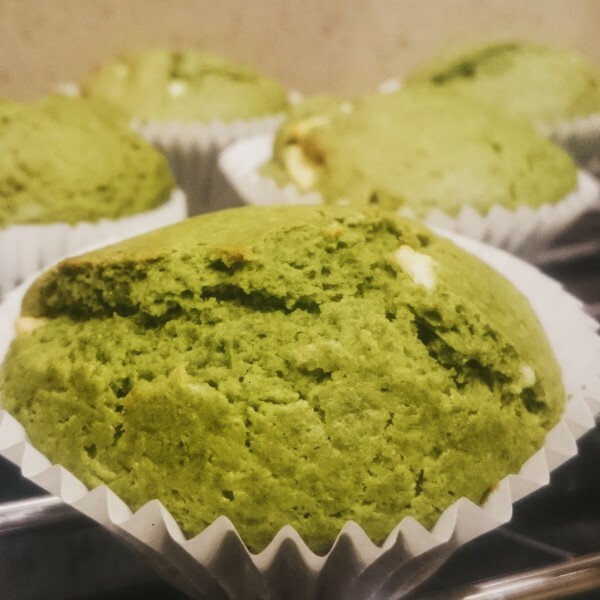 Gently fold the flour and Matcha mix into the egg in 2 or 3 smaller portions. Finally, using a bread knife break the chocolate bar into small pieces and add to the mix. Heat up your oven to 200C. Line your muffin tray with cupcake liners and fill them 2/3 full. Place in the oven for around 20 minutes and test with a skewer to make sure the muffins are done. If the skewer comes out dry take the muffins out from the oven and leave to cool on a rack. Being a green tea, Matcha will oxidise and start loosing the vibrant green colour if left for too long. It's best to store your muffins in an air-tight container and consume within 2 days from baking. 2 Comments To "Matcha and White Chocolate Muffins"
Hi Nick, I'm so glad to hear you tried the recipe, they look amazing! I like your coloured muffin cases, they go well with the green. Apologies for the directions error, I've corrected it now. Thank you for pointing out!